Michigan voters are stuck with the electoral choices they’ve made, whether they like it or not. 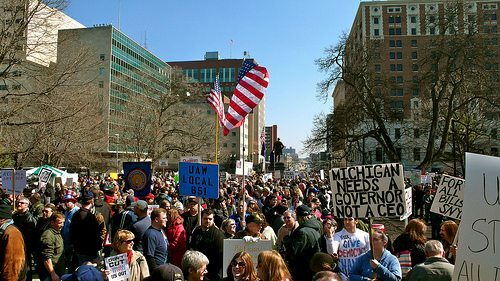 Last week the Michigan Legislature slammed through a Right-to-Work bill, becoming the 24th state to have such a law on the books. The lame duck legislators passed it with no debate, no discussion. It was a cookie cutter law that almost word-for-word matched a template provided by the extreme right wing group ALEC (American Legislative Exchange Council). The very next day, Republican Governor Rick Snyder signed the bill into law. What Right-to-Work laws are purported to do is give workers the “freedom” to not join a union if they choose not to. Conservatives claim that if a workforce is primarily unionized, but if individual workers decide that they don’t want to pay dues or participate in union activities, they shouldn’t have to. If a union is making contributions to a campaign or a particular political cause, the worker shouldn’t be forced (indirectly) to contribute to those causes via his or her union dues. It’s all about choice, they say. It’s about freedom. The conservative theory further postulates that Right-to-Work laws will attract more businesses to a state and create more jobs, and thus it’s a good thing for everybody—win-win. That was what Republicans touted when Indiana became a Right-to-Work state. More jobs and a fast growing economy will come to any state that enacts RTW. Except that there is scant evidence that RTW has a direct affect on a state’s economy in either direction. Republicans point to lower unemployment numbers in RTW states, but study after study has failed to show that there is a direct correlation. One thing we do know for certain is that workers in RTW states earn on average $1,500 less than in non-RTW states, and they get fewer benefits. It can be argued that the Southern states where RTW is more prevalent have a lower cost of living, and therefore the lower wages, in effect, are insignificant. Maybe true, but health and retirement benefits are still worse in RTW states. Companies earn higher profits, workers earn lower wages overall. Claims of protecting workers’ choice are nothing more than a red herring, too. Federal law already states that no worker can be forced to join a union under any circumstances. In non-RTW states, however, non-union workers can be required to pay an “agency fee” to the union, since those workers still reap the rewards of collective bargaining efforts, earning the same wages and same benefits as unionized workers. After all, why should non-union workers be allowed to enjoy the same advantages without having to contribute their fair share? In RTW states, these “free riders,” as they’re called, don’t have to pay agency fees. The truly surprising thing is that this is all happening in Michigan, the birthplace of the UAW and epicenter of the US auto industry; a place where unions have played a critical role for nearly a century. In 2009 the auto industry was rescued from the brink of extinction in this country, thanks largely to the efforts and concessions of the unions and their members; and because of it, by all accounts, Michigan’s economy is bouncing back. Contrary to conservative claims, a good working relationship with employee unions saves jobs and actually grows the economy, since workers earn better wages and in turn have more resources to pour directly back into the economy. Unions ensure a vibrant and healthy middle class, which is the primary driver of economic growth. Are unions perfect and always right? No, of course not. But neither are the businesses that employ their workers. The auto industry’s near demise came about largely because of gross mismanagement by company executives. And it has been well documented that Hostess’ bankruptcy came about not because of a unionized workforce, but entirely due to the utter and complete incompetence on the part of the company’s management force. What’s happening in Michigan—just like what’s happening in Ohio, Wisconsin, and Pennsylvania—has nothing to do with economics and everything to do with politics. Republicans in those states are deliberately seeking to dismantle Democratic support systems by defunding unions and by instituting restrictive and incredibly anti-democratic voter ID laws, among other controversial policies, in order to ensure that Republicans have a permanent advantage. They can’t win on their policies, so they have to game the system in order to win elections (it didn’t work in 2012, mostly). But while media pundits and Democratic lawmakers are busy excoriating their Republican counterparts and the shadowy figures that push their agenda, such as the Koch brothers and Karl Rove, there is one entity that has escaped scrutiny: The voters who elected these lawmakers in the first place. In 2010, Republicans swept into power, claiming significant (and in some cases overwhelming) majorities in state capitols nationwide, including Wisconsin, Ohio, Pennsylvania, and of course, Michigan. All four of those states also sent Republicans to the statehouses where previously Democrats had resided. Voters got caught up in the Tea Party fury and chose to put Republicans back in power. The results were entirely predictable. In Ohio, Governor John Kasich and the Republican legislature enacted laws to strip union rights from a largely blue collar workforce, a move that was quickly overturned by voters in a special election. In Wisconsin, the Republican legislature and Republican Governor Scott Walker enacted similar measures, sparking massive protests and a recall election in which Walker managed to survive–barely. In Pennsylvania, their Republican legislature and Republican Governor Tom Corbett plowed through a voter ID law that would have kept nearly one million Pennsylvania voters—mostly Democratic voters—away from the polls on Election Day. It was a move that the speaker of the House declared “would allow Mitt Romney to win the state of Pennsylvania,” thus helping him win the election (he did neither). In Michigan, it started with Snyder’s emergency manager Law, which unilaterally allowed the governor to declare a local government—most any local government—in dire financial straights, giving him the power to oust duly elected public officials and in effect declare martial law, putting in place an executive who then had the authority to completely rewrite every law in that municipality, break any contract he or she saw fit, fire as many public workers as he or she pleased. You don’t like the finances or curriculum in a school district? No problem! Send in an Emergency Manager to remove the school board and take over the district, closing as many schools and firing as many teachers as possible, all in the name of good fiscal policy. And now comes RTW—a law that Governor Snyder did not run on and had previously said he had no interest in enacting. Last week, during a lame duck session of the legislature, they rushed it through, and Snyder signed it. There was no debate on these laws in any of these states. This was a clear agenda in all of them on the part of the Republicans who enacted them spurred on and spoon fed by the Koch brothers and Karl Roves that funded them, and nothing and no one was going to stop them. These laws were clearly not what the voters wanted. This was not what they bargained for. They got caught up in the Tea Party rage and swallowed the Tea Party hook, and voted Republican. Elections have consequences. Every 10 years the United States is constitutionally required to conduct a census to measure the nation’s population. This census information is then used by state and local governments to determine the boundaries of electoral districts—Congressional, State Assembly and Senate, county board of supervisors, and city council districts. In most states—including Michigan, Pennsylvania, Ohio, and Wisconsin—the party in power gets to draw those districts, and they do so in a manner that ensures as many electoral victories as possible. In 2012, those redrawn districts provided all the cushion Republicans needed to protect their majorities in legislatures and in the US House of Representatives, despite losing the Presidency and losing badly in the Michigan, Ohio, and Wisconsin US Senate races. Elections matter. Elections have consequences. And when we don’t take our elections seriously, bad things happen. In 2010, Michigan voters chose to send Republicans into control in their state. They chose a Republican governor over a popular Democratic candidate after having a Democrat serve the previous two terms. RTW and emergency manager legislation could never have happened during Jennifer Granholm’s administration, and they would not have happened if Michigan selected Virg Bernaro as Granholm’s successor. Michiganders may not have gotten what they wanted out of their state government, but they most certainly got what they voted for. Elections are a choice, and Michiganders are forced to live with their choice for two more years. Next time they should choose more carefully. Right on, Andy. The voters in these states have a lot of soul searching to do. I hope they have learned their lessons. Unfortunately, we’ll have to wait till 2020 until the districts can be redrawn again. Until then it will probably be impossible to elect Democrats in some districts because they have been gerrymandered to be “safe” Republican districts. The voters may have locked themselves in for 10 years. They better be aware from now on of the consequences of voting.